For me, pork and mushroom is such a good combination. Add to that sage and the comforting pairing becomes an earthy trifecta. 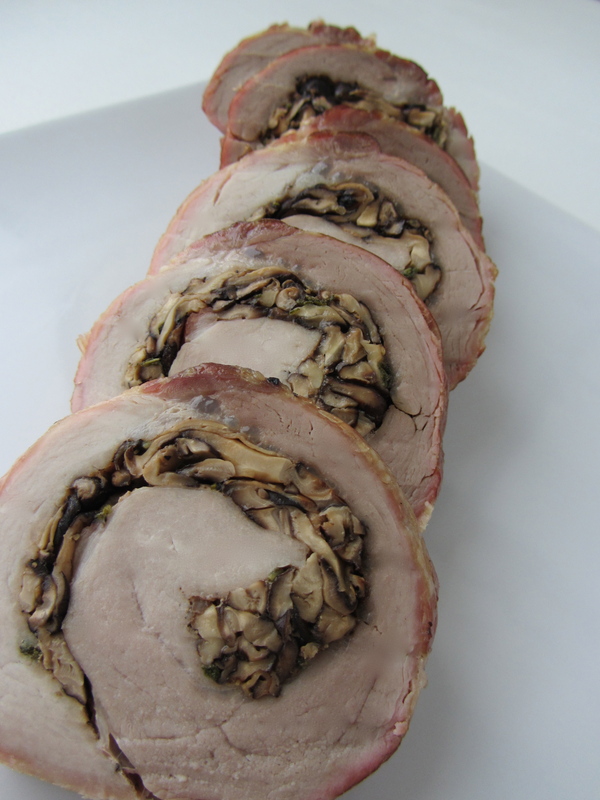 I like to use shiitake mushrooms because they have such a distinctive taste that is enhanced by the sage, which really comes out nicely against the mellow background flavor of the pork. 1. Preheat oven to 350F. Trim off any excess (but not all) fat from the pork. Butterfly the loin by slicing into it horizontally, but not all the way through. It should open like a book. Using your fist or a mallet, pound the meat to about 1/2 – 3/4 inch thickness. (If using a mallet, cover the meat with a sheet of plastic wrap to prevent tearing of meat.) Season both sides with a big pinch of salt and pepper. Set aside. 2. Prepare the stuffing. Slice the mushrooms thinly, discarding the stems. In a medium skillet over a medium-low heat, heat a tablespoon of olive oil, then cook the mushrooms until they are tender (about 8 minutes). Season to taste with salt and pepper. Mince the sage leaves and add in during the last minute of cooking. 3. Spread the mushrooms over the cut side of the pork. Roll the loin up, being careful not to displace the filling. Tie together with kitchen twine spaced 1.5 inches apart. Place seam-side down into a roasting pan. Rub one tablespoon of olive oil over the top. 4. Roast at 350F until meat at center reads 150F on an instant read thermometer, about 60 minutes (or 20 minutes per pound). Cover with foil and allow to rest for 15 minutes before removing twine. Slice into 1 inch thick slices to serve. * When checking the temperature, take several readings to be sure you are getting the meat and not the mushrooms. * If there are drippings in the pan, deglaze over the stove with some wine or stock to make a quick sauce. * Don’t have shiitake? Any other mushroom would work just as well.